So my new board game, co-designed with the super-talented David Thompson, will be released at Essen Spiel in Germany this week. 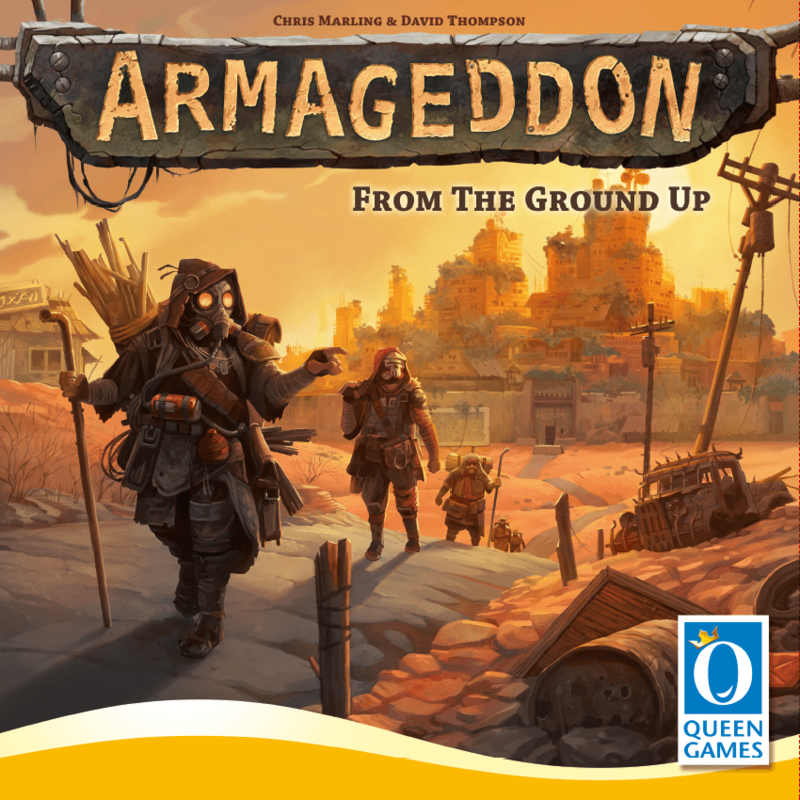 Called Armageddon, it has a post-apocalyptic theme but is much more a euro game than a traditional ‘thematic’ one (despite what the amazing artwork from Markus Erdt may lead you to believe). The game takes about 90 minutes to play and is for 3-4 players. Because bidding is a key part of the game, it really didn’t work with two – and to take it to an extra player would been pricey on components: a risk it probably wasn’t worth taking, considering the probably price hike. But if it does well, who knows…? The game was very much designed from the theme from the start. The idea was to try and simulate the growing of those small towns you see in films such as Mad Max and Water World where they’re trying to do things right after some kind of global tragedy – only to be whupped by some chain wielding biker types. Well not this time! The key mechanisms are bidding, tableau building and worker placement. Each round you’ll have a set of workers (there are different types that can different things) who you’ll choose to assign to three areas – two bidding areas (buildings and survivors) and your tableau (worker placement). You’ll take it in turns to place workers (from behind your screen) into an area until everyone has bid into each (once you’ve placed, you can’t change it). The advantage in going early into an area is order breaks ties – but of course others know what they need to do to beat you. People on your tableau (town) will be working (upgrading types of worker, getting VPs etc) or defending against marauders. So everyone gets some workers/marauders, plus a new building, and then operates their towns. Some rounds you may really want a juicy building, others you may really want a certain set of survivors (they’re random pulls from a bag), others you’ll want to all hands to the pumps – but usually all the above. For those not going to Germany, I’m sorry but I can’t put a store date on the game yet – but I’d hope it will be available from UK game stores/websites before Christmas. If you want any more info, just let me know in the comments below.